Coldwater’s Friends Day Food Pantry is open from noon to 2 p.m. on the second and fourth Saturdays of each month or by appointment at other times. During the holidays, the schedule may be adjusted. Volunteers distribute three bags of groceries to an average of 120 families at each Friends Day. Volunteer drivers also deliver groceries to 40-50 homebound seniors each Friends Day through the Senior Mobile Pantry. Coldwater distributes around 80,000 pounds of food each year. To volunteer, email volunteers@coldwater.me or call 816-786-0758. Because of Coldwater's partnership with Harversters, as little as $5 can buy 50 pounds of food. Please make checks payable to Coldwater and send them to Coldwater, 501 NE Missouri Rd., Lee's Summit, MO 64086. Coldwater distributes 2-3 bags of groceries two Saturdays a month and by appointment during the week. In addition to food purchased through Harvesters Food Bank, Coldwater welcomes food donations/drives throughout the year to fulfill the need. Following is a list of the most needed food items: peanut butter, jelly, canned/boxed meals, canned pasta sauce, macaroni and cheese, canned fruits and canned vegetables, and canned tuna/chicken. No outdated items, please. Baby, hygiene and cleaning items are always needed. The Clothes Closet is open twice a month in conjunction with the Food Pantry and by appointment for special situations. It provides clothing for all ages as well as some household items. Volunteers distribute about 500 items of clothing each Friends Day. Coldwater will take clean, gently used clothing in any size that is not stained or torn. Shoes, coats, bedding and household items also are accepted. Coldwater is not accepting furniture or large items at this time. 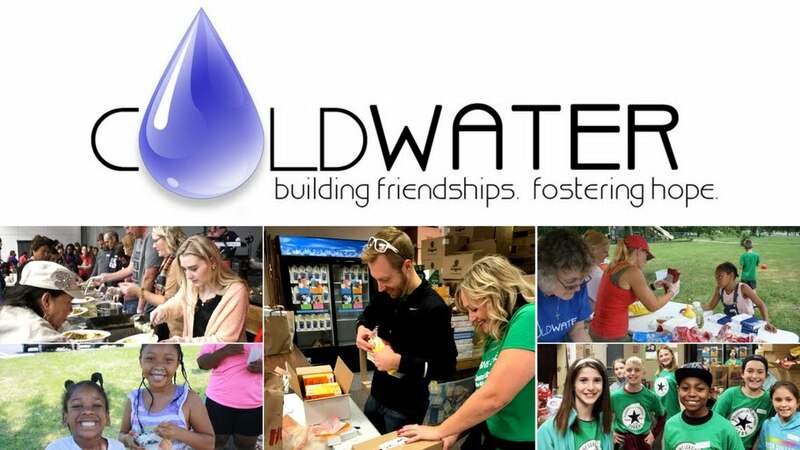 Through this program, Coldwater matches large, donated items to need requests received. Coldwater accepts furniture, beds (frames, mattresses, box springs), some appliances, electronics (not televisions), baby items, and medical equipment for those with disabilities. If you have an item to donate, please contact Coldwater at 816-786-0758. A bond develops among those who sit down to share a meal. Coldwater’s Hot Lunch Program provides an opportunity to build friendships by sharing a healthy meal together. What started out as coffee and donuts for friends visiting the Food Pantry & Clothes Closet quickly evolved into a hot meal twice a month. As volunteers and Coldwater friends dine together, barriers come down and relationships form. In 2011, the Hot Lunch Program received the Harvesters Circle of Hope Award for its on-site meal program. About 150 meals are served each Friends Days. 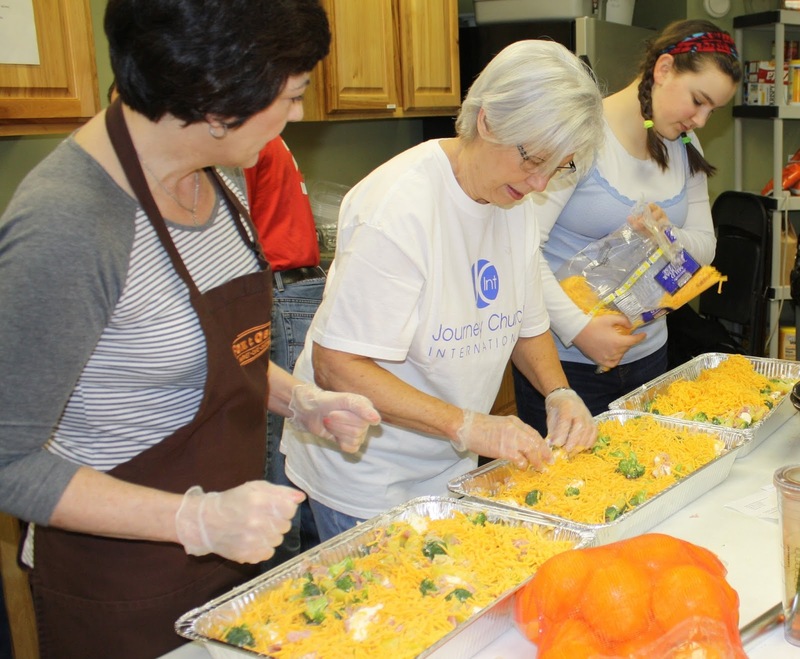 Six to 12 volunteers help prepare and serve the Friends Day lunch, in addition to those who visit with friends. To volunteer, email volunteers@coldwater.me or call 816-786-0758.